Collapse coverage for first-party property claims in New York is important because of the large building damages involved and the various policy exclusions that help determine whether the policy affords coverage for the claimed loss. As with any other complex problem, however, you should start with the basics: the definition of collapse. In our last article on the subject, we discussed what constitutes a collapse in New York. Some courts have concluded that a collapse occurs when the structural integrity of a building is substantially impaired. Royal Indem. Co. v. Grunberg, 155 A.D.2d 187, 553 N.Y.S.2d 527(3rd Dept. 1990). Others require that a collapse include an element of suddenness, a falling in, and total or near total destruction. See Graffeo v. U.S. Fid. & Guar. Co., 20 A.D.2d 643, 246 N.Y.S.2d 258 (2nd Dept. 1964), motion for leave to appeal denied, 14 N.Y.2d 685, 198 N.E.2d 911 (1964). It’s also important to know the reasoning behind the rules in order to understand how they apply to any given claim. In this article we are going to discuss the reasoning behind the substantial impairment rule, set out in Royal Indem. Co. v. Grunberg, supra. A close examination of the facts of that case expose the reasons why the rule has been implemented in so many jurisdictions. In Royal v Grunberg, supra, the insureds were homeowners who purchased land on which to build their house. It was a modular home, in which the pre-fabricated sections are transported to the site and, as they are placed on the foundation, joined together into a finished home. The land on which it was built was hilly and overlooked a ravine; it must have had a gorgeous view. During the course of construction, however, the Insureds noticed serious problems. One wall of the house, which faced the east, or the downslope of the hill, as well as a deck, were seven inches out of plumb. Certain windows and doors wouldn’t open or close. A large number of cracks developed throughout the house, including a four inch deep crack that ran along the entire basement floor. The foundation wall on the east, or downslope, side of the house, bowed outward; and the house itself tilted in the same direction. The house, in other words, looked like it was leaning downhill. It did not, however, fall down or fall in; its walls still stood; and it was not reduced to rubble. It still was a house, not a pile of debris. The Insureds repaired the damage and made a claim to recover under their policy of homeowner’s insurance for the cost of the repairs. The carrier disclaimed coverage and commenced a declaratory judgement action seeking a declaration that the Insureds’ claim was not covered by the policy. The main issue in the case was whether the house had collapsed, even though it had never fallen down. 1. Agreed on the cause of the loss: Substandard foundation materials, and improper methods of construction and site preparation. The bowing, bulging, and cracking was caused by different areas of the foundation settling at different rates, because the foundation was constructed partly on rock and partly on landfill. 2. Agreed that the damage occurred during the course of construction. 3. Agreed that the only way it would be covered was if it was the result of a collapse. Collapse Under Coverages A [dwelling] and B [other structures]. [Plaintiff] insure[s] for direct physical loss to covered property involving collapse of a building or any part of a *189 building caused only by * * * (f) Use of defective material or methods in construction * * * if the collapse occurs during the course of the construction * * *. Loss to [a] * * * foundation * * * is not included * * * unless the loss is a direct result of the collapse of a building. Collapse does not include settling, cracking, shrinking, bulging or expansion. SECTION 1–PERILS INSURED AGAINST * * * [Plaintiff] do[es] not insure loss: (1). Under Coverages A, B and C [personal property]: * * * (b) caused by: * * * (f) settling, cracking, shrinking, bulging, or expansion of pavements, patios, foundations, walls, floors, roofs or ceilings * * *. The court in Royal v Grunberg, supra, held that the definition of a collapse was the substantial impairment of the structural integrity of a building. Using that definition, it held that the Insureds’ house indeed had collapsed and that coverage was afforded for the loss under the Insureds’ homeowner’s policy with Royal. It relied on the evidence, virtually all of which pointed out that the house inevitably would have fallen in had no repairs been made. Even the carrier’s appraiser stated that had the Insureds done nothing, i.e., made no repairs, the house would have fallen in and that would have been a collapse and a covered loss under the policy. When you look at the facts of the case, the reasons for the ruling are not hard to discern. The house would have fallen down sooner rather than later. Anyone who looked at it would have seen that is was going to fall. When a foundation wall bows, especially one that is designed to prevent a house from sliding down a hill into a ravine, it’s a scary prospect; so, too, is a house leaning in the same direction. It is the rare building that can lean over for an extended time without completely toppling, or crumbling. Sympathy definitely lay with the Insureds. The real reason the court sided with the Insureds, however, probably goes back to the rules of policy interpretation. A court cannot construe a particular provision of an insurance policy in such a way as to emasculate the clear intent of its other provisions. See Graffeo, supra. Any ambiguities in a policy, especially ones found in an exclusionary clause, have to be interpreted in favor of the insured and against the insurer. Breed v. Ins. Co. of N. Am., 46 N.Y.2d 351, 353-54, 385 N.E.2d 1280, 1282 (1978). “[i]n the case of a loss to covered property * * * [to] protect the property from further damage * * * [and] make reasonable and necessary repairs to protect the property”. Royal Indem. Co. v. Grunberg, 155 A.D.2d 187, 189, 553 N.Y.S.2d 527, 528 (3rd Dept.1990). 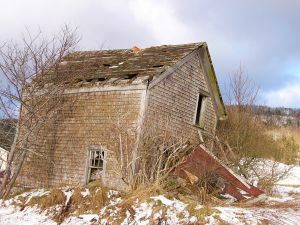 The court found it impossible to reconcile the Insured’s duty to protect covered property from further damage, and to repair damage that had occurred, with what would have been the requirement that the Insureds, if they wanted to collect for the inevitable collapse, could not make any repairs until the house actually crumbled. By holding that the house, which was still standing, had collapsed because its structural integrity was substantially impaired, the court allowed the Insureds to collect the cost of repairs to keep the house standing. That, presumably, was less than the cost to pick up the pieces from the bottom of the hill and rebuild the house. If the latter would have been covered, why not cover the former and have everyone pay less? This doesn’t mean that Collapse Coverage will apply to every building in New York whose structural integrity has been substantially impaired. That depends on the policy language; how collapse coverage is afforded; and on whether particular exclusions apply, including for hidden decay and possibly earth movement. Every insurance adjuster and insurance carrier should remember that the definition of collapse in New York is the starting point, not the ending point, for determining whether collapse coverage applies to a given loss.